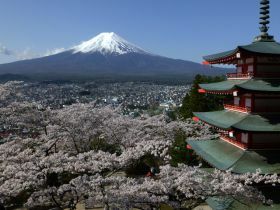 The Chureitou Pagoda is a five storied pagoda on the mountainside overlooking Fujiyoshida City and Mount Fuji off in the distance. The pagoda is part of the Arakura Sengen Shrine and was built as a peace memorial in 1963 nearly 400 steps up the mountain from the shrine's main buildings. especially during the cherry blossom season in mid April when there are hundreds of trees in bloom and during the autumn color season which usually takes place in the first half of November. The spot is particularly popular among photographers as it allows for some wonderfully stereotypical shots of Japan. Map from 「Shimoyoshida station」 to 「CYUREITOU PAGODA」 is this.